Chronic anterior knee pain (CAKP) is among the most common postoperative complication following interlocking nailing of tibial diaphyseal fractures. Many factors are held responsible, but nothing has been conclusively pinpointed. Literature suggest its incidence ranging from 10% to 86%. Severity differs among various individuals causing limitations in activities of daily living. Multiple factors such as ligament injury, meniscus damage, cartilage damage, reflex sympathetic dystrophy, retropatellar fat necrosis, tendinitis, quadriceps atrophy, and change in gait are theorized but lack corroborative evidence. Surgical errors such as nail malposition and protrusion and long protruded proximal screw are also thought to play an important role for anterior knee pain as well as scarring of the patellar tendon due to midline tendon-splitting incision. The objective of this study was to analyze the factors leading to postoperative anterior knee pain following intramedullary interlocking (IMIL) nailing of the tibia and to study the association factors such as nail prominence beyond proximal tibial cortical bone, approach: transtendinous versus paratendinous, accuracy in entry point, and proximal screw length. Ninety-two consecutive patients with an isolated tibial shaft fracture, treated with reamed IMIL nailing in our institute from 2014 to 2016, were included in the study. All adult patients without any comorbidity and ligament injury with previously painless knee were included in the study. Informed consent was taken from all patients. Three patients had infection, needing nail removal for control of infection, and one patient suffered RTA and operated tibia fractured again and nail was bent in situ. These four cases were excluded from the study. In transtendinous approach, about 2.5 cm long straight incision was given over the middle of the patellar tendon; the tendon was cut in the same line and following instrumentation, repaired with Vicryl 3.0 for tendon and Ethilon 3.0 for skin. In paratendinous approach, medial longitudinal incision was given and care was taken not to violate tendon or sheath postsurgery, from day 2 static quadriceps exercises, and knee bending was initiated and mobilization with crutches started with toe touch to the ground. Weight-bearing started from 6 weeks with full weight-bearing at 12 weeks. Postoperatively, patients were assessed for CAKP as per visual analog scale (VAS) and divided into two groups: those having CAKP and those not having anterior knee pain. Knee pain during rest, walking, stair climbing, stair descent, and squatting was noted separately on a VAS of 0–10. Those with VAS <1 were included into the asymptomatic group. Patients were regularly followed up every 3 months for 2 years. Radiologically, to determine nail prominence in relation to the bone cortex, lateral radiographs were taken to evaluate knee-apex distance. 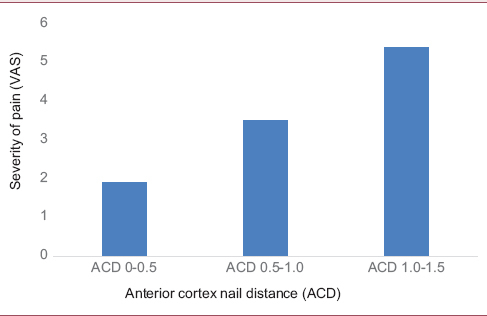 Knee-apex distance is the sum of anterior prominence and superior prominence [Figure 1]a and [Figure 1]b. Anterior cortex-nail distance (ACD) was calculated in symptomatic group to study the effect of anterior prominence on pain score [Figure 2]. Ultrasound evaluation of knees for changes in patellar tendon morphology and nail protrusion was done. Patients were examined in the supine position with the knee flexed at 20°. Noted parameters were thickness differences of the patellar tendon at the proximal and distal ends of knees, calcification, and changes in echogenicity. Statistical analysis was done with SPSS software (IBM, SPSS inc., Chickago, USA). Student's t-test and Chi-square test were used. P < 0.05 was taken to be statistically significant. Twenty-eight (32%) out of 88 patients developed knee pain, and 60 (68%) patients were painless (VAS <1) at follow-up. The results were evaluated based on nail protrusion, prominent proximal screw, approach, and accuracy of entry point. Most of these patients had multiple causes of CAKP. Of the total evaluated 88 patients, 45 patients had some degree of nail prominence, out of which significant prominence (nail buried <1.25 cm in relation to tibial plateau) was found in 36 patients. Out of these 36 cases, while 25 (69%) had CAKP, the severity of this pain increased with increased anterior nail-cortex distance. Thus, significant nail protrusion is the most common cause of CAKP in this study and occurred in 82% of symptomatic patients (25 out of 28 patients). The rest 52 patients did not have significant prominence, out of which 49 (95%) were asymptomatic and only 3 (5%) patients became symptomatic. This difference was statistically significant with P = 0.000. Thirty-four patients in total had larger proximal screws protruding out of bone, out of which 15 (44%) developed pain and rest 19 (56%) were painless. Fifty-four cases had screw of optimal length, out of which only 13 (24%) cases developed pain and rest 41 (76%) were asymptomatic. This difference was significant with P = 0.04. Twenty-four patients were operated by paratendinous approach, out of which 9 patients (37.5%) had CAKP and 15 (62.5%) were asymptomatic. Sixty-four patients were operated by transtendinous approach; 19 (30%) had CAKP and 45 (70%) were asymptomatic. This difference in incidences was not statistically significant between these two groups (P = 0.48); however, the number of patients operated by prothrombin time (PT) approach was small for comparison to draw any definitive conclusion. Protrusion of nail at superior end beyond the tibial surface might lead to irritation of the retropatellar fat pad. Kneeling, squatting, or cross-legged sitting have a greater pain incidence in this study and may be related to the need of more knee flexion and subsequent impingement. This impingement can produce pathologic changes in fat pad and tendon., Ultrasonic evaluation has found thickened, disorganized patellar tendon, areas of calcification, and synovitis, with IL nail in situ in this study. A strong association of nail prominence, i.e., sum of anterior and superior prominence with knee pain (P = 0.00) is shown. In patients where the nail was well buried in proximal tibia, the sum of the combined superior and anterior prominence of nail in both AP and lateral radiographs is usually more than 2.5 cm. These patients had less incidence of pain (P = 0.00). When the prominence was significant, i.e., the knee-apex distance lesser than 2.5 cm, more cases became symptomatic (25 out of 36, i.e., 70%) [Figure 1]a and [Figure 1]b. Superior prominence of interlocking nail has greater effect on knee pain. Keating et al. calculated the ACD (Anterior cortex-knee distance) in symptomatic cases to quantify its effect on knee pain score Group I had ACD 0–0.5 cm, Group II had ACD 0.5–1.0 cm, and Group III had ACD >1.0 cm. Average VAS for pain in Group I was 1.9, 3.5 in Group II, and 5.4 in Group III [Table 1]. Therefore, choosing the right size of the nail and burying the tip are always recommended. Large proximal screws protrude beyond the bone surface and their sharp tips can irritate the soft tissues and cause inflammation nearby and that might be a source of pain. In femoral IMIL nailing, this has been described and iliotibial tendinitis is reported. Regarding perfection in point of entry (sweet spot), it is apparent that safe zone for entry can be better localized by preoperative fluoroscopic guidance with a radiopaque pointer to find whether a medial parapatellar, transpatellar, or lateral parapatellar approach gives best direct access to the entry point.,,, In this study, scalpel blade itself was routinely used as a radiopaque pointer before making the skin incision. Incidence of cartilage or meniscus damage is uncertain in this study; which is not uncommon as observed Herningou et al. in follow-up, clinically, no patient had signs of meniscus or ligament injury as evaluated by Lachman, Drawer, McMurray, and pivot-shift tests. However, subtle damage to these vital structures possibly during surgery and its association with CAKP may be better evaluated by magnetic resonance imaging. Postsurgery, entry point was assessed by true AP and true Lateral radiographs. This study did not find a significant association between pain and inaccurate entry (P = 0.23). Transtendinous approach has been suggested in many literature to be associated with more incidence of CAKP postsurgery.,,, However, some find that the difference is statistically insignificant. Theoretically, in transtendinous approach, the use of retractors and reamers causes repeated injury to the vital structures through the substance of patellar tendon and retrotendinous fat pad., In paratendinous approach, patellar tendon is not split, but vigorous use of retractors traumatizes patellar tendon, sheath, and the fat pad. Repeated intraoperatgive trauma to patellar tendon and surrounding soft tissue is the causative factor to pain. Individual variation in the patellar tendon anatomy should be considered when choosing the proper entry site. In this study, the number of patients operated by PT approach was small in comparison to thrombin time approach; statistical significance could not be drawn out of it (P = 0.48). Väistö, in his prospective ultrasonic study, did not find statistically significant difference in ultrasonic appearance of the patellar tendon between symptomatic and asymptomatic patients, irrespective of the approach. 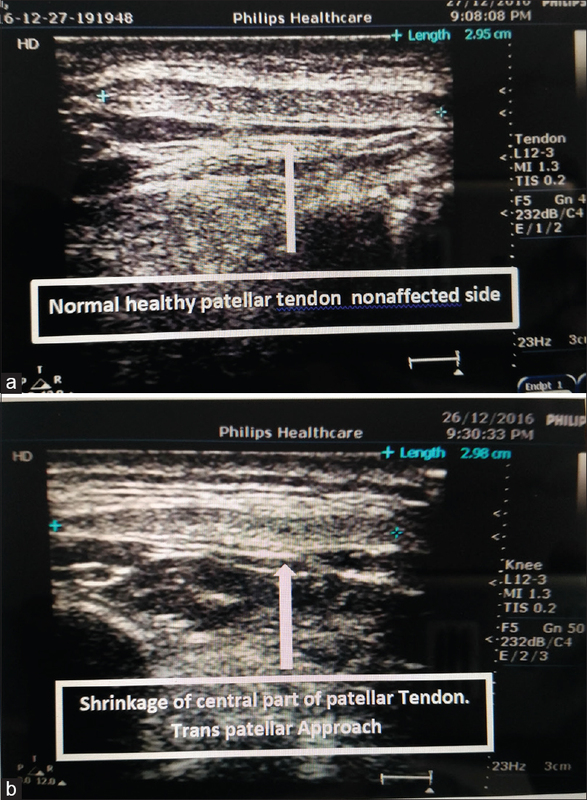 In this study by ultrasonic evaluation, shrinkage in the substance of patellar tendon in its central part in cross-sectional view was noticed uniformly in nearly all cases in transtendinous approach group [Figure 3]a and [Figure 1]b, whereas tendon morphology was similar to that of the contralateral knee in paratendinous approach group. Areas of calcification, mixed echogenic changes, and thick and disorganized tendon were noted, but the difference was not statistically significant. Devitt, in his study, shows arthroscopic evidence of chondromalacia patellae in small number of patients with anterior knee pain postnailing. The increase in force and contact pressure on lateral facet occurs in medial PT approach. Flexion of knee to >100° results in minimum pressure changes at patellofemoral joint. CAKP has also been associated weakness of thigh muscles.,, Pain causes reflex inhibition of quadriceps and atrophy follows. Electromyography studies have shown modification in neuromuscular control of quadriceps in patients with CAKP following interlocking nailing. Most of the studies find quadriceps wasting as a result rather than as etiology behind anterior knee pain. We did not find quadriceps wasting which may be attributed to static quadriceps and hamstring exercises strictly followed from the 2nd postoperative day. Some studies report that nail removal improves knee pain.,,, However, some also report worsening of symptoms. Routine removal is not recommended. In this study, 18 patients had undergone nail removal for various reasons; only 7 out of them had anterior knee pain. Postremoval pain did not worsen in any of those. Prominence of nail beyond proximal tibial cortical bone and larger proximal screw length has a strong association with postoperative CAKP following IMIL nailing of the tibia. 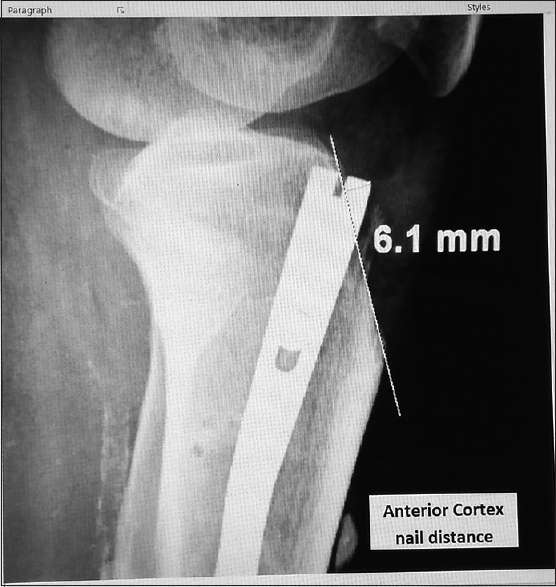 This study finds statistically significant association of CAKP with prominence of nail beyond proximal tibial cortical bone (P = 0.00), and larger proximal screw length (P = 0.04). These are avoidable surgeon-related factors and can be modified with due attention to techniques during surgery. Choosing the implant of optimal length and burying the tip of the nail can reduce the incidence of postoperative knee pain. Court-Brown CM, Gustilo T, Shaw AD. Knee pain after intramedullary tibial nailing: Its incidence, etiology, and outcome. J Orthop Trauma 1997;11:103-5. Toivanen JA, Väistö O, Kannus P, Latvala K, Honkonen SE, Järvinen MJ, et al. Anterior knee pain after intramedullary nailing of fractures of the tibial shaft. A prospective, randomized study comparing two different nail-insertion techniques. J Bone Joint Surg Am 2002;84-A:580-5. Keating JF, Orfaly R, O'Brien PJ. Knee pain after tibial nailing. J Orthop Trauma 1997;11:10-3. Väistö O, Toivanen J, Paakkala T, Järvelä T, Kannus P, Järvinen M, et al. Anterior knee pain after intramedullary nailing of a tibial shaft fracture: An ultrasound study of the patellar tendons of 36 patients. J Orthop Trauma 2005;19:311-6. Althausen PL, Neiman R, Finkemeier CG, Olson SA. Incision placement for intramedullary tibial nailing: An anatomic study. J Orthop Trauma 2002;16:687-90. Kramers-de Quervain IA, Engel-Bicik I, Miehlke W, Drobny T, Munzinger U. Fat-pad impingement after total knee arthroplasty with the LCS A/P-glide system. Knee Surg Sports Traumatol Arthrosc 2005;13:174-8. McConnell T, Tornetta P 3rd, Tilzey J, Casey D. Tibial portal placement: The radiographic correlate of the anatomic safe zone. J Orthop Trauma 2001;15:207-9. Hernigou P, Cohen D. Proximal entry for intramedullary nailing of the tibia. The risk of unrecognised articular damage. J Bone Joint Surg Br 2000;82:33-41. Orfaly R, Keating JE, O'Brien PJ. Knee pain after tibial nailing: Does the entry point matter? J Bone Joint Surg Br 1995;77:976-7. Devitt AT, Coughlan KA, Ward T, McCormack D, Mulcahy D, Felle P, et al. Patellofemoral contact forces and pressures during intramedullary tibial nailing. Int Orthop 1998;22:92-6. Samuelson MA, McPherson EJ, Norris L. Anatomic assessment of the proper insertion site for a tibial intramedullary nail. J Orthop Trauma 2002;16:23-5. Nyland J, Bealle DP, Kaufer H, Johnson DL. Long-term quadriceps femoris functional deficits following intramedullary nailing of isolated tibial fractures. Int Orthop 2001;24:342-6. Callaghan MJ, Oldham JA. Quadriceps atrophy: To what extent does it exist in patellofemoral pain syndrome? Br J Sports Med 2004;38:295-9. Väistö O, Toivanen J, Kannus P, Järvinen M. Anterior knee pain and thigh muscle strength after intramedullary nailing of tibial shaft fractures: A report of 40 consecutive cases. J Orthop Trauma 2004;18:18-23.